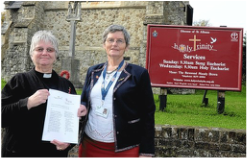 Holy Trinity Church in association with Churches Together have set up the Winter Night Shelter to provide help for those who are homeless in the Bishop’s Stortford area. The shelter, first set up in December 2015, will be running from the 5th December to 28th February 2017. The Shelter offers 8 bed spaces every night and is run by a team of volunteers both from the church and local community. Last year’s night shelter was a great success and many of the people who found themselves homeless over the winter season were helped greatly by the programme. The shelter continues its work throughout the year offering people the opportunity to do laundry, shower and have a hot meal once a week. Whilst the reaction to the Shelter has been extremely enthusiastic they are still appealing for volunteers to help cover the many shifts this season and would love your help. If you are over 18 you can get in touch with the team via the Facebook page and lend a hand to a great organisation. Go ahead and really make a difference in your local community!